First and foremost a big thank you to all who have purchased a copy or subscribed already. More of you than we ever expected took the plunge and signed up before the first edition was even back from the printers, and we are most grateful to each and every one of you. While we are proud of the fact we have gone back to grass-roots with ScooterNova, offering it for sale in person at scooter rallies and events, through local scooter shops and also via mail order subscription, this does mean that the message takes a while to spread. Thanks to social media and the internet however, it is easier to spread that message today than it was 35+ years ago! So for those who have not yet had the pleasure of ScooterNova, here is a little of what the brand new magazine is about. Brought to you by some well-known and established scooter riders and writers, ScooterNova is a quality magazine both in content and physical production from a bunch of people with plenty of experience of scooters and writing about them; Andy Gillard and Stuart Lanning are behind the editorial and distribution of ScooterNova, with contributions to issue 1 by the likes of Sticky, Iggy, Ann Murphy, Gareth C Brown, Paul Hart, Ben Ford and Bill Lewis. The magazine is published bi-monthly, A4 in size, 100 pages long and printed on high quality paper, as we feel a quality publication should be in our opinion. “The Rider’s Choice” as ScooterNova is known, focuses on the scooters, the journeys, the travel, the machinery and the rider’s themselves, with no space for adverts about Lambretta cuckoo clocks, electronically reclining chairs for pensioners or ‘comfortable slacks’. Instead, the adverts – and we all know that magazines and newspapers require adverts to survive with an affordable cover price – are related to the content of a scooter magazine as they should be. 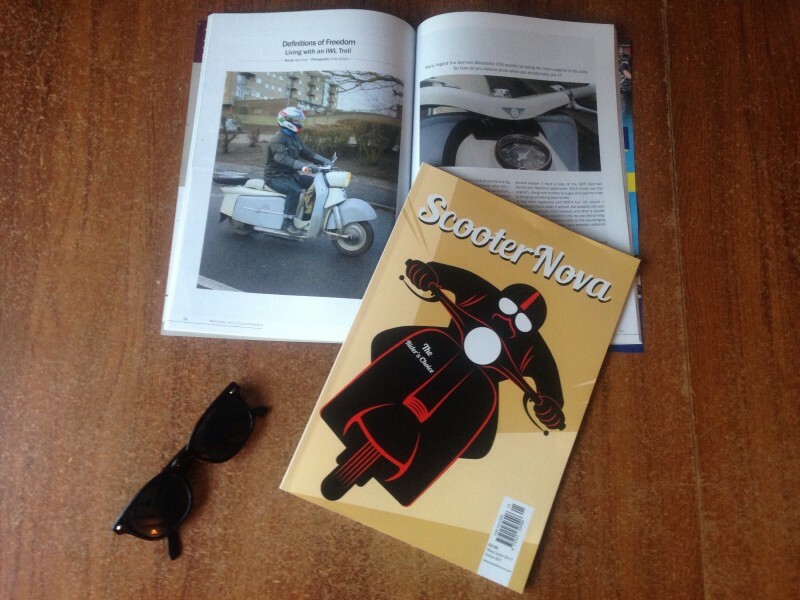 The articles are written by genuine scooterists with the same dedication to scooters as the reader, and an interest to expand their knowledge as often as possible and share that with one and all. Like yourselves, we too want to know what the scooter scene in Indonesia is like, the best route for touring eastern Germany on a classic scooter, what drives a man to build a full-blown custom Lambretta, how to keep a former Cold War commuter vehicle on the road in 21st century Britain, how much better a GS150 was (or was not?) than a Douglas G, and of course all join in with the celebrations of the Vespa PX’s 40th anniversary. With subscribers from around the UK as well as the USA, Canada, Australia, Italy, Germany, Spain, France, Belgium, Holland and beyond the word about ScooterNova is spreading. So if you’ve not seen it yet, please check out whether your local scooter shop stocks it here. Better still, why not have it delivered straight to your door via mail-order, either a single issue or subscription can be bought here. You can also buy it from us at scooter rallies and events. We will be at Kelso BSRA National Scooter Rally in Scotland selling magazines with the Crusader Promotions rally patch and T-shirt stall there, and also at the EuroLambretta rally in Adria, Italy, selling via the Lambretta Club of GB stall there. Of course if you’ve already discovered what your new favourite scooter magazine is, then please feel free to share the news and spread the word. ScooterNova is here and the overwhelming feedback so far is that it is just what the doctor ordered! The SECOND edition of ScooterNova magazine will be published towards the end of June, so please come and see us at Cleethorpes BSRA National scooter rally at the beginning of July to celebrate its launch there! We also received a large number of requests for merchandise, so we launched a range of T-shirts and messenger bags at Weston-Super-Mare scooter rally a few weeks ago… and promptly sold out! Fear not though dear reader, we have shirts on the printing press as we speak, with more bags being produced as well. Please check out our online WEB SHOP for more details, or come and see us at the next rally we’ll have a full ScooterNova stall at, hopefully Cleethorpes. This entry was posted in Lambretta, New Products, Road Trip, scooter, Scooter Event, Scooter Rally, Vespa and tagged Bags, classic, club, jetset, lambretta, mag, magazine, merchandise, messenger bags, new, news, scooter, scooter magazine, scooter scene, scooter world, scootering, scooterist, scooternova, shirts, SLUK, T, t shirts, Vespa by admin. Bookmark the permalink. Thank you. We should have some available in the next or so hopefully. Hello David, after selling out of our first run of merchandise at an event, we have a few bags available now on the website. If they disappear again, we’ll restock within a week or so. Yes I am after a bag many thanks for letting me know .